Minton jug - 2" (50 mm) high. 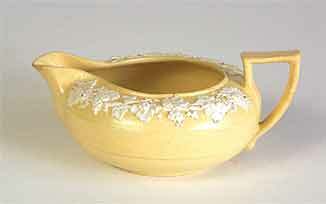 Minton, one of the best known British manufacturers of ceramics has been in existence since 1793. It was founded by Thomas Minton but grew to its greatest popularity in the nineteenth century under the management of Herbert Minton and then, after his death, by his nephew Colin Minton Campbell. The company was based in Stoke, but for a short time in the early 1870s also had premises in London known as the Kensington Art Pottery Studio. Although much fine work was produced at Kensington, the venture was not as financially successful as expected and after its destruction by fire in 1875 was not re-opened. Mintons (the 's' was added in 1873) owed its success, particularly in the last quarter of the nineteenth century, to its extremely talented designers. Of particular note are Louis-Marc-Emmanuel Solon and his son Léon Victor Solon. Solon Snr. introduced the well known Mintons pâte-sur-pâte designs; a technique where decorations are built up with layers of slip and then applied to the pot before firing. A subsidiary company, Minton Hollins, was set up in 1845 under the direction of Michael Daintry Hollins to manufacture tiles. In 1868 Hollins broke loose and the company continued quite independently until 1962. Successful artists and designers of the time produced designs for their tiles, including Walter Crane and Augustus Pugin, the designer of the British Houses of Parliament. Minton art pottery ranges that are best remembered are 'Majolica ware', not true Majolica but relief decorated porcelain with white slip under brightly coloured clear tin glazes, 'Secessionist ware', during the art nouveau period, and 'Astra ware'. Astra ware was a very successful and relatively inexpensive range introduced towards the end of the First World War and continuing until the 1930s. The name 'Mintons' is now owned by Royal Doulton, who continue to manufacture wares in the Minton style under that brand name.